Marie Claire = £3.99 – Balance Me Hand Cream (50 ml) – worth £10.00 choice of two – I chose the ‘Super Moisturising’ one– it comes sealed so I have not tried it yet as so many hand creams to use up at the moment – free sample sachet of Sanex Body Lotion and discount codes also included within magazine. Subscribe to Marie Claire from £18.99 for 12 issues by Direct Debit (DD) – free Elemis Pro Collagen Oxygenating Night Cream worth £60.50 with subscription – (see photos below for details) always usually an offer on so if this particular offer has finished just check online for other offers. 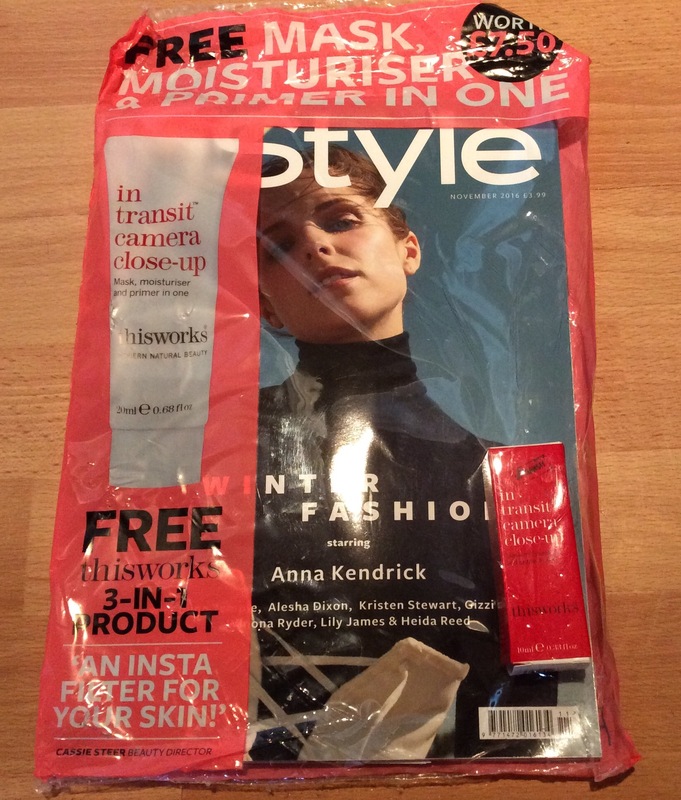 InStyle = £3.99 – Free Thisworks In Transit Camera Close Up Mask, Moisturiser and Primer in one– 10 ml worth £7.50 – it comes in a box and free sample sachets of Tresemme Shampoo & Conditioner and discount codes also included within magazine. Subscribe to Instyle from £18.99 for 12 issues by Direct Debit (DD) –free Erno Laszlo gift worth £35 with subscription – (see photos below for details) always usually an offer on so if this particular offer has finished just check online for other offers. As advised previously each month I will update each month’s magazine freebie post when I see additional magazine freebies or when relevant offers become available. (once again a reminder that magazines always dated month in advance i.e. you get the November issue in October).